So the big dilemma of what to post today was finally remedied when I realized next week is Thanksgiving and I don't post again until Friday. 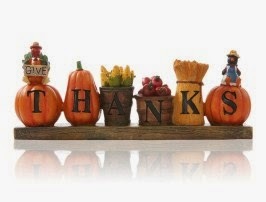 Therefore Happy Thanksgiving to all my family, friends and supporters! I hope your day is filled with family, good food, football, and a wonderful nap! To me, there is nothing better than Thanksgiving. It's my favorite holiday for plenty of reasons, the main one being we celebrate having each other in our lives, instead of having to buy something. In my post I am listing all that I'm thankful for but most of all, to wish all of you a warm, wonderful holiday season! 1. Family - My Husband, children, grandchildren, Mom, and all my relatives near and far around the world! Oh, and my sweet Branch! 2. Good friends, old and new. You have all been so supportive and encouraging! 3. My home, and food for the table. 5. My books, and the one's I am writing and plan to write in the future. 6. My fans that look forward to my next books and let me know that! 7. My new website and Heather who is designing it with great patience! 8. Living in the wonderful state of Colorado. 9. Getting to stay home to write and be there for my Mom. 10. The love I have from so many people. And I love them all back! I am so grateful for my life and those in it. Thank you all for continuing with me on my journey with life and with writing. All of you mean the world to me! Have a wonderful time next Thursday!